Posted on Thu, Feb 2, 2012 : 2:15 p.m. Distracted driving is getting worse in Michigan, according to a new statewide report from MLive.com, which shows that at least 900 crashes involving a cellphone were reported in 2010. Over the past decade, according to the report, more than 9,000 crashes were reported - and another 34,000 involved other forms of distracted driving. 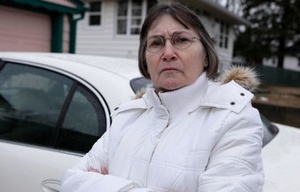 Mary Williams of Ypsilanti is among the thousands of people in Michigan affected by distracted driving. Mary Williams of Ypsilanti is one person who's been affected. She and her mother were in a crash in Bay County that was caused by a 16-year-old who'd dropped her cellphone. Now, Williams told Mlive.com, “I received a neck injury and a pretty bad concussion. I’m still suffering repercussions from that with memory loss." The story is part of an investigation by news organizations within the new MLive Media Group. AnnArbor.com has its own localized story scheduled to run on Sunday. Read the overview report on distracted driving. Read the full story on Mary Williams. Fri, Feb 3, 2012 : 5:24 p.m.
Fri, Feb 3, 2012 : 3:45 p.m. It's not just trivial "Personal use" of cell phones that is so dangerous while driving. I recently had the expiriance of traveling with my wife who is a regional manager for a national company. She has always been an excellent driver with no points on her driving record. During our four hour trip she was on the phone constantly, making deals or talking with employees. She made so many mistakes while on the phone, I thought I was driving with my teenage boys. She is a great multitask individual, but listening to the obnoxious GPS while talking on the phone and using a calculator is nuts. At one point she asked, "Would you grab my laptop from the back seat" while we were traveling 75 mph! I politely asked her "Could you not talk on the phone while driving", or "just let me give you a break from the wheel baby." She was annoyed by my comments and went on to inform me, that it was" her job and her employer's expectation to be on the phone while driving." It was at that point that I realized just how dangerous the roads had become. Think of all those business men and women, doctors, attorneys, sales people, contractors, truck drivers, police officers and others, whose job it is travel daily while having to stay in constant contact. And I was worried about "Shoe bombers" who can't even light a match and fly at the same time! Fri, Feb 3, 2012 : 4:49 p.m.
Refreshingly honest and insightful. Rare for this site. Fri, Feb 3, 2012 : 2:07 p.m.
That's just what we need. More government intrusions in our life. Did it ever occur to anyone that every problem does not require a government response.? We could pass a law that requires a police officer in every car, then NOTHING would go wrong. Of course we'd have to pay for that and we'd have to give up our rights, but it's worth it, right? NO! Folks that have accidents now get tickets. Enough tickets and they lose their license. And their insurance goes up. Enough bad driving, and they can't afford to drive any more. The system works. We don't need more laws (there are so many now that people don't bother with them anyways) we need more responsible citizens. Fri, Feb 3, 2012 : 5:05 a.m. I'm no journalist or English teacher, but... this &quot;article&quot; seems to leave a lot to be desired. First of all, the article is 5 paragraphs long, yet has only 8 sentences. Really? Your first two paragraphs were only one sentence? Next, what exactly is the point? Do you propose a fix, an alternative, or a solution? And also, you open with &quot;Distracted driving is getting worse in Michigan, according to a new statewide report from MLive.com, which shows that at least 900 crashes involving a cellphone were reported in 2010.&quot; Umm.. Worse than WHAT? And do you plan to support this statement with facts? You follow up with &quot;Over the past decade, according to the report, more than 9,000 crashes were reported - and another 34,000 involved other forms of distracted driving.&quot; I am assuming you meant that 9000 crashes were reported to involve cell phone use (does anybody proofread this publication?). If so, that averages out to about 900 cell-phone-involved crashes per year, right? So unless you choose to give us some better data, we can only assume that crashes involving cell phones are worse than the time when cell phones were not readily common among the driving public. This would be like saying that over the last 40 years there has been a 9000% increase in fatalities of drivers whose cars had airbags. On another note, I can assure you that the reported numbers are WAY low. If you know anything about how crash statistic data is recorded in Michigan, you know that crash data comes from state compilation of data from UD-10 crash reports which are basically bubble forms completed by the police who are only putting in what they are told by the people involved in the crash. And unless somebody says &quot;I was on the phone...&quot; that doesn't get colored in on the bubble form because, guess what... EVERYBODY these days tries to say that the other person is at fault and was on the phone when the crash occurred. Fri, Feb 3, 2012 : 12:44 p.m.
Fri, Feb 3, 2012 : 5:01 a.m.
We just need to start treating it like drunk driving. Sat, Feb 4, 2012 : 2:02 a.m.
Mike, are you serious? You think there's a difference between killing someone due to distracted driving as opposed to drunk driving? I guess it just matters depending upon whose life is ruined. I know what I'm saying and I'm saying you obviously have a different set of values than me. Fri, Feb 3, 2012 : 12:52 p.m.
Yeah, that's a great idea. Finacially ruin someones life and ability to support their family and hold a job. Are you for real? You don't even realize what you're saying. Fri, Feb 3, 2012 : 4:41 a.m.
Today I was trying to merge onto US 23 S from Gedess and the guy in front of me is going 30 miles an hour. Yeah, 30 miles an hour to merge onto the highway. Completely oblivious to his surroundings. He doesn't even merge until the last possible second. That is a long merge lane too. I was stuck behind him and when I finally went around...yakking on his phone. And I almost got rear ended a few times today. I admit I was too close when the car in front of me pulled up short to turn into a gas station. But the car behind me had to slam on breaks too. Good thing they worked! We need to back off and leave more space in between cars. I'm trying to take a note out of my own book here too. Some days it seems like too many close calls! Fri, Feb 3, 2012 : 4:14 a.m.
Keep in mind 60mph = 88 feet per second. How fast are you reflex wise on the brakes! Fri, Feb 3, 2012 : 3:53 a.m.
You know, I used to think that the main purpose of being behind the wheel of a car was to drive the car. But judging by what I see people doing when they're driving, that no longer seems to be the case - the most hair-raising example I see at least several times a week is the driving/talking on the cellphone/smoking trifecta. I ask you, with those three activities going simultaneously, how firm a grip does such a driver have on the steering wheel? Fri, Feb 3, 2012 : 1:56 a.m. Following in A2 inane initiatives ban cell phones while idling. Fri, Feb 3, 2012 : 12:09 a.m.
most of the time a person has a reasonable idea when the drunks might be on the road, in the case of texting and talking on the cell phone it could kill someone or a family member at anytime. Thu, Feb 2, 2012 : 10:56 p.m.
Never mind the distraction with dialing/talking on cell phones---it's everyone having smart phones and checking their emails, directions, google, restaurant reviews, etc....and every other app that is out there. Laws never seem to keep up with technology. Thu, Feb 2, 2012 : 9:42 p.m. Cell phone drivers always make defensive comments about other types of distracted driving trying to defend their use of phones. Well, this article is about cell phones and a cell phone takes a lot more distraction. A cell phone takes a lot more looking away from the road. A cell phone user has to look down at the phone for extended periods of time while calling or texting. Eyes are not off the road while talking to other passengers or adjusting the radio. Thu, Feb 2, 2012 : 10:36 p.m.
Thu, Feb 2, 2012 : 9:30 p.m. Distracted driving of any kind is reckless and intentional endangerment of the lives of others. Whether it is your cellphone, your state of intoxication or medication, your engagement in eating and drinking, talking, fiddling with your radio and other controls- when you aren't paying attention to the road and keeping your vehicle under control, you are a 'distracted driver' and you are responsible for the harm you do to others. Our laws should reflect this level of intention when distracted driving causes an accident. Is that phone conversation or text more important than the life of another human being? I think about this often, every time I see someone driving by with their cellphone in use, because I recently lost a loved one to a horrific accident in which a cellphone figured. Every day my business takes me out onto the roads and I see many drivers talking on their cellphones, and every day I see frightening near misses where these same drivers endanger the lives of other drivers and pedestrians. And those are just the drivers who are visibly distracted. This is not an issue of freedom, it is an issue of operating a vehicle responsibly and according to the laws that govern your earning this privilege. No one has the right to drive a vehicle. Like many other activities, it is subject to regulation. You have to demonstrate your ability to drive, and you have to continue to demonstrate that ability on a regular basis. The driver's license does not give you the right to drive in a distracted manner, it gives you the right to drive in accordance to the law. And that license can be taken away. Perhaps we need zero tolerance when distracted driving causes accidents- automatic revocation of the driver's license. This isn't trivial, just think about how hard it will be to function without a driver's license- no job, no social life, no shopping, no getting around on your own...no life! Fri, Feb 3, 2012 : 5:04 a.m. Zero tolerance for distracted driving is a nice idea, but difficult to enforce. How many drivers would admit to causing an accident because they were using a cell phone or otherwise distracted? It's not as if that's something that is easy to spot from another moving vehicle, unless the other drivers are staring at that car, which would also count as distracted driving. Thu, Feb 2, 2012 : 9:20 p.m.
Michigan is so far behind other states that completely ban cell phones while driving. Come to think of it, Michigan is behind in a lot of things. We will never see cell phones banned while driving in this century. How many people have to be injured or killed before any thought is given to this? Thu, Feb 2, 2012 : 9:18 p.m.
Not fair, The Terminator and Robocop could drive with digital distractions, and even the oft inebriated David Hasselhoff communicated with &quot;Kit&quot; in Knight Rider. Thu, Feb 2, 2012 : 9:10 p.m. I no longer go through a &quot;drive thru&quot; window and eat my food on the go. I realized how often I was distracted getting my food out of the bag and unwrapped. Thu, Feb 2, 2012 : 8:51 p.m.
Ban the use, regardless of whether it is handsfree. Hands free people are still dialing, and studies show the dialing is one of the most dangerous aspects. I can't count the number of times I've been nearly hit while crossing with the light in a crosswalk by a driver who was talking on a phone. I was once hit by a driver who was illegally texting. Thu, Feb 2, 2012 : 8:35 p.m. Distracted driving, whether caused by phones, food, radios, hot beverages, texting, passengers, or whatever else you care to pin it on, is only a symptom of the underlying condition: Americans do not take driving seriously enough. It's just that simple. Prior to the graduated licensing laws, obtaining a driver's license through the Secretary of State was only slight more difficult than getting plastic toy that Lucky the Leprechaun had buried in his box of breakfast cereal. Nowadays, I understand it isn't much harder. Countries such as Germany or Finland take licensing seriously. The driver's ed programs take roughly 4 years to complete, require studying books that are thicker and denser than a telephone directory, and have multiple exams and road tests, covering all possible scenarios one might encounter while driving (emergency maneuvers, poor weather/road conditions, etc). Here, they tell you that a driver's license is a privilege, not a right, but that statement sounds rather hollow when you realize that trained chimps would be better at operating a motor vehicle than many of the drivers you'll encounter in a given day. If passing drivers ed were half as challenging as it is in Germany, there would be fewer accidents and fatalities on our roads. Fri, Feb 3, 2012 : 1:17 p.m.
You think that is bad? I just found out they added more stuff to a school bus road test then when I took it years ago. Occupy DMV they have way too much time on their hands. Whats a differential? @Mike: It's not by sheer coincidence that countries with more comprehensive driver's education programs have a lower rate of automobile accidents and fatalities. Clearly, passing laws that are difficult to enforce are not working. @Burl: Germans are better drivers, as a result of superior training. I think that's something we'd all strive for. Government intervention has nothing to do with it. But, since you want to go off in that direction, do you think commercial air travel would be more or less safe, if pilot's licenses were easier to obtain? Fri, Feb 3, 2012 : 3:20 a.m.
Thu, Feb 2, 2012 : 11:21 p.m.
You are so wrong! UNtrained chimps could probably do better than the majority of drivers. Thu, Feb 2, 2012 : 10:32 p.m.
Thu, Feb 2, 2012 : 8:30 p.m.
Thu, Feb 2, 2012 : 8:14 p.m. This distracted driving thing has gotten out of control!!!! It's time that the Legislature really tighten up laws on using cellular phones while driving a car! While they're at it, they need to outlaw any and all radios inside of vehicles because what if someone changes the station while they are driving?!?! Drivers should also not be allowed, without risking a fine in the thousands of dollars, to have any children under the age of 10 in their cars. Because it's &quot;proven&quot; that people talking on cellular phones is dangerous while driving, then we can also deduce that having a conversation with anyone in your car is also dangerous. So, I also propose that you are not allowed to have ANY passengers in your car at any time. Mirrors? They should be automatically locked down so that you can't adjust them while driving, and only while stopped, with the car in park, and the emergency brake set. While we're at it we also need to outlaw &quot;Driving while upset&quot;, &quot;Driving while late&quot;, &quot;Driving without first having a full 8 hours of sleep, documented by video surveillance&quot;, &quot;Driving while drinking water&quot;, and &quot;Driving while chewing gum&quot;!!! After all of these laws are passed we need to then install giant pillows along the side of the highway so we're all that much safer. Thu, Feb 2, 2012 : 8:11 p.m. Here comes the new fun thing to persecute. People get to fiddle with their radio, talk to their passengers, eat food and there isn't some &quot;grassroots&quot; movement trying to stop people doing those things. Either all things are allowed, or none of the things should be allowed. Who gets to pick and choose? I don't remember electing these anti-phone zealots to anything and think its a darn shame that people in todays day an age would try to limit freedom. Fri, Feb 3, 2012 : 4:21 p.m. Comparing eating and texting/talking seems a little disingenuous. Fri, Feb 3, 2012 : 10:50 a.m. Requiring everyone to pay the level of attention you want them to because you think you have the right to do so is persecution, SMC. And I agree with burl. Freedom is disintegrating at a rapid rate due to anti-cellphone zealots. This needs to stop. Before it gets Orwellian. Fri, Feb 3, 2012 : 5:10 a.m. Requiring someone to pay attention to what they're doing when operating a motor vehicle is persecution? Fri, Feb 3, 2012 : 1:22 a.m. When radios became a thing for cars, that became a distraction. Then there was the eating thing. Yup, eating thing. I remember something about it in the 70's. Now? Texting and Talking on the phone. Yup. It has gone that far. I never worry when I am in the car. I am good to go. Thu, Feb 2, 2012 : 7:44 p.m. They should make the new DOT law that's for commercial drivers for everyone. If you get caught talking not on a hands free device or testing its a $2750.00 fine. You get one of those you might think twice about steering with your knee to up date your facebook statius. Thu, Feb 2, 2012 : 9:59 p.m. I agree, also a $2750.00 fine for talking to the person in the passenger seat as well. (sarcasm). Thu, Feb 2, 2012 : 8:20 p.m. @brad..I was just giving a &quot;in a nut shell&quot; of the new law. I think hand free devices are just as bad myself and should also be part of the law. Thu, Feb 2, 2012 : 8:10 p.m.
&quot;Hands free&quot; doesn't make that much difference. It's your brain that needs to be free, and it is occupied while you carry on a conversation. Everyone. Thu, Feb 2, 2012 : 7:45 p.m.
Thu, Feb 2, 2012 : 7:35 p.m.
Where is the &quot;It scares the hell out of me every time I drive&quot; option? Thu, Feb 2, 2012 : 8:02 p.m.
&quot;Every minute that I'm in a car&quot; seems to be just as good. Thu, Feb 2, 2012 : 7:30 p.m.
Thu, Feb 2, 2012 : 7:26 p.m. It's so ridiculous that phoning/texting while driving is not severly punished. They're not essential for driving. I can only chalk it up to our politicians having no true regard for public safety. Of course, they and our protectors are busy chatting away behind the wheel themselves. Donations to political campaigns don't hurt, either.